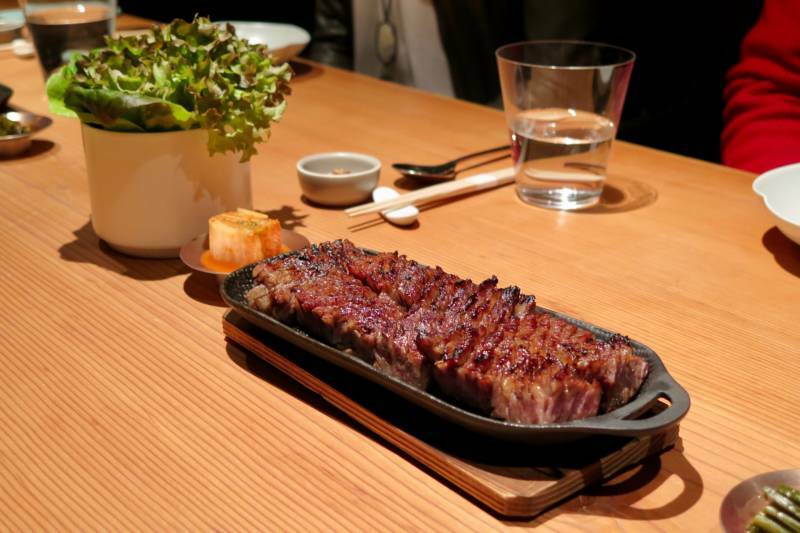 Track down the galbi at Maum in Palo Alto, Indian Paradox gets a technicolor update, don’t miss the Made In: Denmark pop-up at Baana (with a dinner with chef Nick Balla! ), the latest Chef’s Cubano from Reem Assil at Media Noche, and a night of California food and drink history. 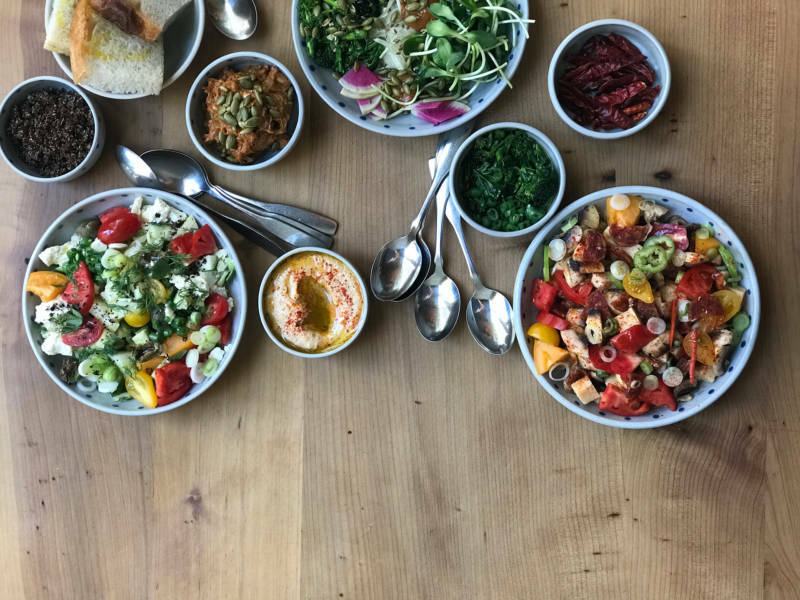 Anyone looking for a unique dining experience who has a little extra money to burn (and enjoys Korean food and flavor profiles) will want to check out Maum in Palo Alto — yes, even if you’re in San Francisco. You’ll enjoy a multi-course tasting menu that offers a modern take on Korean dishes and flavors, with California seasonality and quality ingredients woven in. There’s only one seating for dinner Thu–Sat for 16 diners who have booked a ticket through Tock ($175, and $100 for the excellent wine pairings, which you’ll want to do). The restaurant is basically one big private dining room, with a long wood table, and you can peek into a top-of-the-line kitchen at the back of the room. The space is full of other natural materials and colors, and it’s very minimalist but still welcoming (and very stylish). 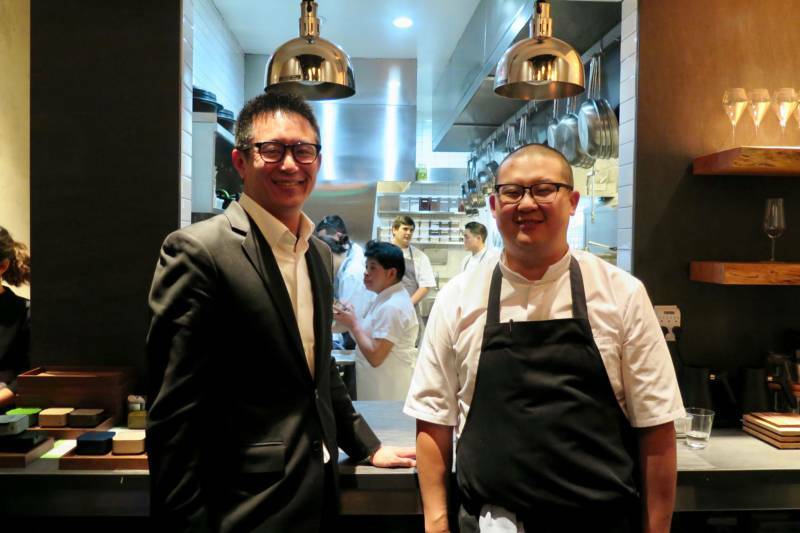 Maum was originally a private dining experience for guests of owners Brian and Grace Koo, and then they decided to open it as a part-time restaurant. 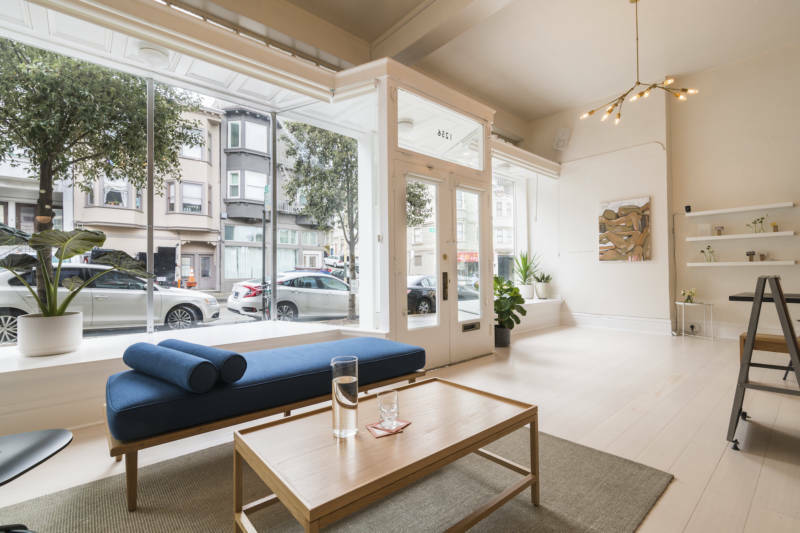 They brought on consultant Charles Chen, now a managing partner, who has worked with Tartine Manufactory, Stonemill Matcha, and other projects on their openings and operations. 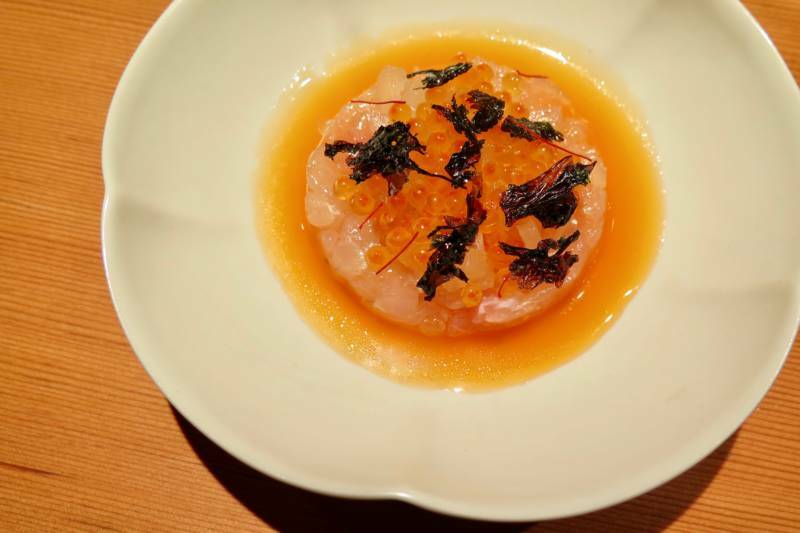 The chef is Michael Kim, whom I met when he was the opening chef de cuisine at Namu Gaji in San Francisco — he has also worked at Redd and SPQR. His wife, Meichih Kim, has worked at Benu and Per Se, and is the mastermind behind the fabulous desserts. Upon arriving, you’ll be greeted with Champagne and a wave of canapés, like a chestnut tartlet with a cloud-like filling and plump oysters topped with kimchi granita (but a bit too icy). It’s similar to a cocktail party, with a chance to mingle with some of the guests you’re going to be dining next to over the next couple of hours. Honestly, the opening courses were fine but didn’t completely wow me — I think the kitchen could push the flavors and executions more into the “whoa” zone. As an example, while yookhwe (steak tartare) is a Korean dish I adore, the presentation here only seemed updated with the elegant linen it was served upon (and the high-quality beef) — it felt like a missed opportunity to do something really unexpected or fun. By the time you silently glide one of the immensely comfortable, black leather, mid-century modern chairs out and sit down, you will have noticed many of the beautiful plates and stemware and bowls during the opening service, but now it’s really going to be an aesthetic parade. You’ll want to bring home the wood sake cups that are so delicate they can practically fly out of your hand, and the other serve-ware is so elegant and obviously chosen with care. 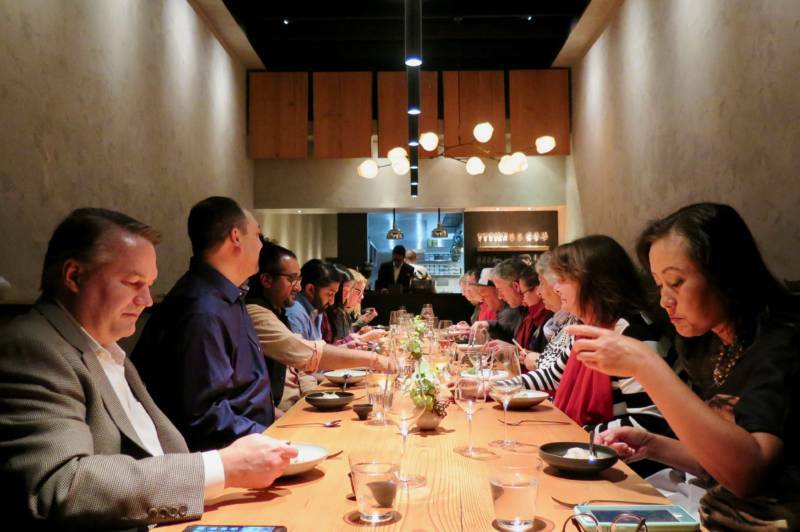 While each course and wine pairing are announced for all to hear at once, it’s done in a way that is unobtrusive and not meant to interrupt the many conversations at the table. We had people celebrating birthdays, a couple from Marin on date night, a large family gathering, and, of course, some Silicon Valley folks — overall, the crowd was more mature than your usual SF hotspot. As the night went on, and the wine kept being poured, it definitely felt like a more lively dinner party. The aged snapper tartare with seaweed and roe was a beautiful opening salvo, and the silky abalone custard with matsutake mushrooms was elevated even further with its extraordinary pairing of Bianchetto, an orange wine from Le Coste, a producer in Lazio. 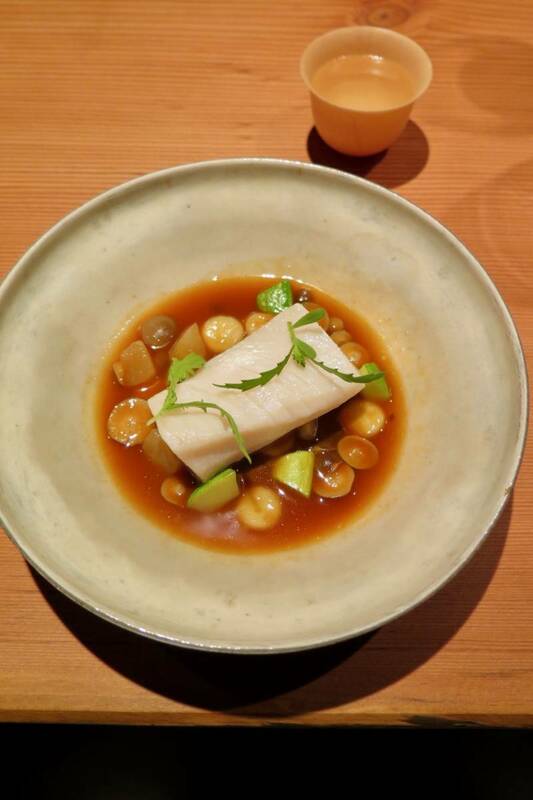 Poached sablefish comes in a broth that shows how soulful the kitchen can be, with a deeply satisfying bass note from the gochujang. The showstopper was the final course: the wagyu galbi ssam. It featured the most exquisite layered cubes of seared and fatty beef short-rib, served with bouquets of lettuce leaves that you use to wrap up the beef in, along with a dollop of spicy jang sauce, and a piece peeled off the elegant cube of kimchi (which you’ll want to request more of, because you need to pour some of the juice from it over the brisket-kimchi rice, which is presented like a paella). 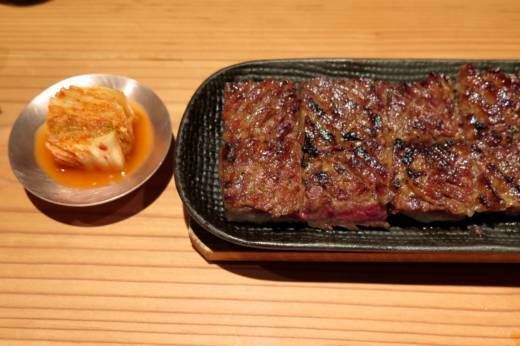 I’d book this dinner on this course alone — I’ve never had galbi come even close to this. Dessert was a fun show, with delightful madeleines, mochi, mignardises, fresh fruit, and more, plus cake to bring home and enjoy later (good thing, because you’ll be stuffed). The tasting menu offers an extensive amount of food — while some may complain of still being hungry after many tasting menus, that is definitely not the case here. In fact, I even brought home my last bites of the rice and galbi, which proved to be the most divine base to my fried eggs the next morning. 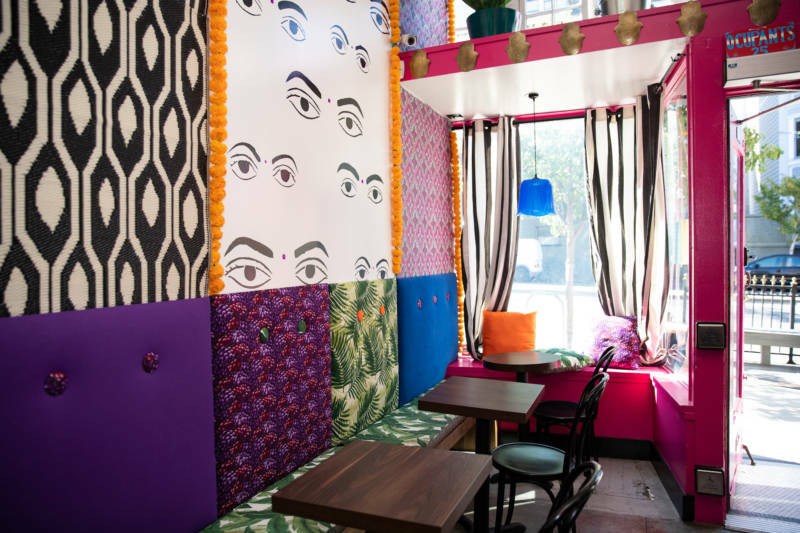 Three years ago, Kavitha Raghavan opened Indian Paradox on Divisadero — her petite wine bar featuring wine pairings with Indian street food dishes (chaats) — and now the space has received a stylish redecoration and colorful upgrade. She partnered with artist and interior designer Lorena Zertuche (co-owner of the vibrant Loló) on the new look, and now the cozy space is full of patterns, color, turbans, and one wall is an homage to the highly adorned Indian trucks you’ll see on the roads in India. Honk! It’s the kind of place that is perfect for a date. 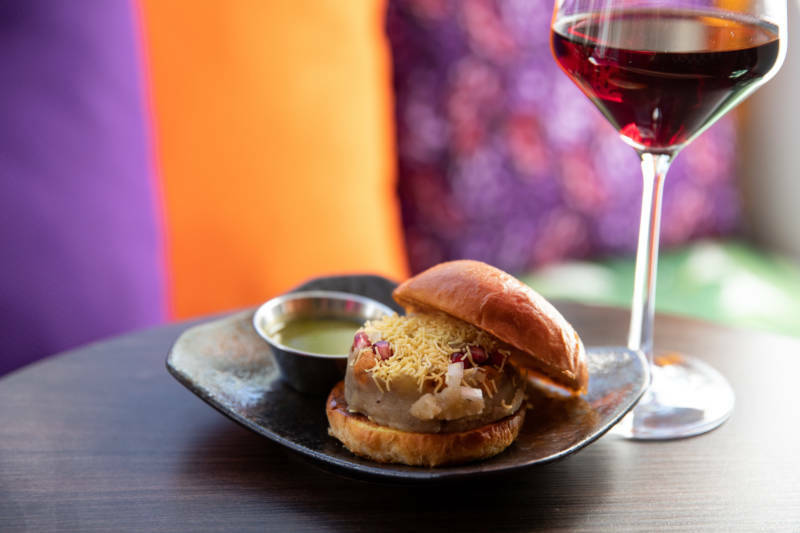 Kavitha also upgraded the stemware, and has launched a new tasting menu with chef Maribel Palomo: the new four-course menu is a chaat experience for $35 per person, with four half-pour/2.5 oz. ($55) or four full-glass/5 oz. ($75) pairings for each course, which include both New and Old World wines. It’s a fun spot to swing by on a whim if you just want a glass of wine and a couple snacks at the bar (don’t miss the sundal with warm garbanzos and unripe mango), or you can build a fulfilling dinner, or just let the kitchen just cook for you and do the full tasting. 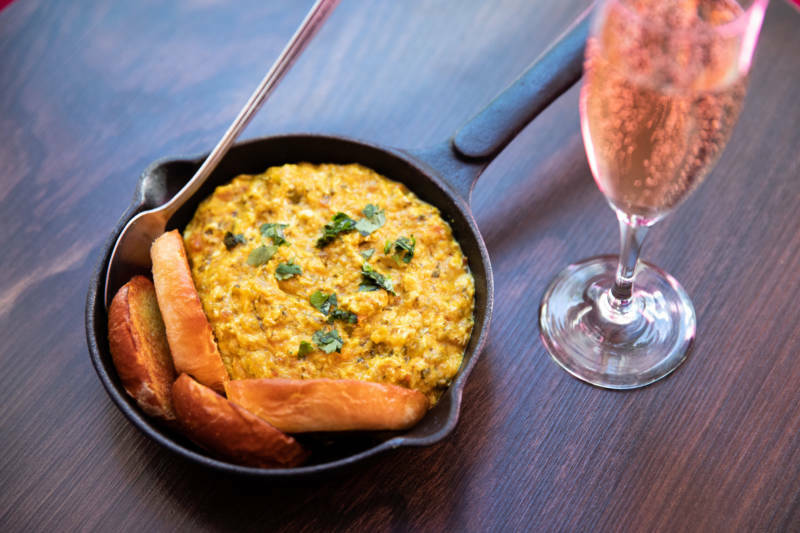 I’m also a huge fan of weekend brunch, served on Saturday from 11am–2pm (don’t miss the egg akuri: soft-scrambled eggs cooked with Parsi masala, ginger, garlic, turmeric, onions, tomatoes, and cilantro, served with buttered toast). More great news: Sunday brunch is coming January 20. You just have two weeks to make it over to Media Noche in the Mission for November’s Chef’s Cubano. 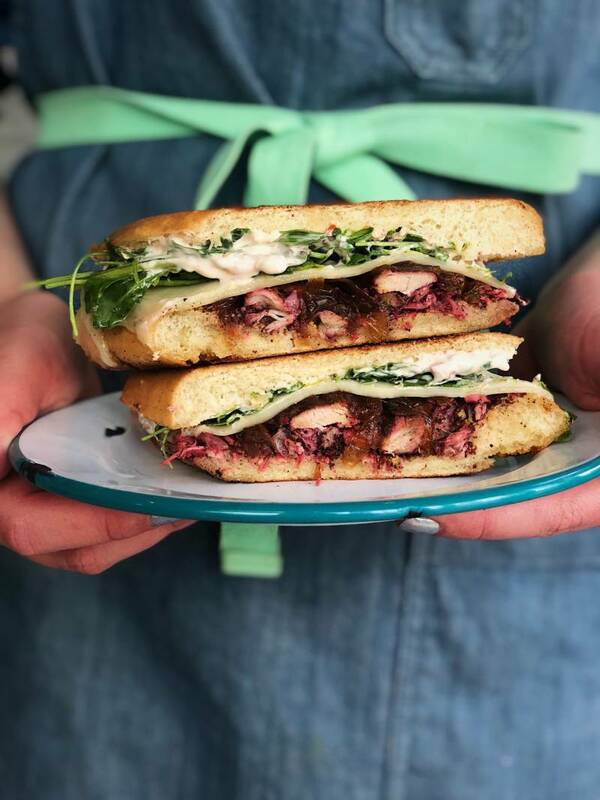 Chef Reem Assil of Reem’s and Dyafa in Oakland has created the La Palestina Cubano, with sumac-braised chicken, melted pepper-jack cheese, pomegranate onions, harissa yogurt, whole-grain mustard, and arugula. It all gets pressed into a golden combination of sandwich perfection. It's $13.50, and 10% of the proceeds benefit Arab Resource & Organizing Center (AROC). This cubano is available through November 30 — you can order delivery via Caviar, and that linked code will give first-timers $10 off your first two orders. Cocktail and history lovers will have plenty to drink and discuss at the 10th annual Historic Libations event, hosted by the California Historical Society. 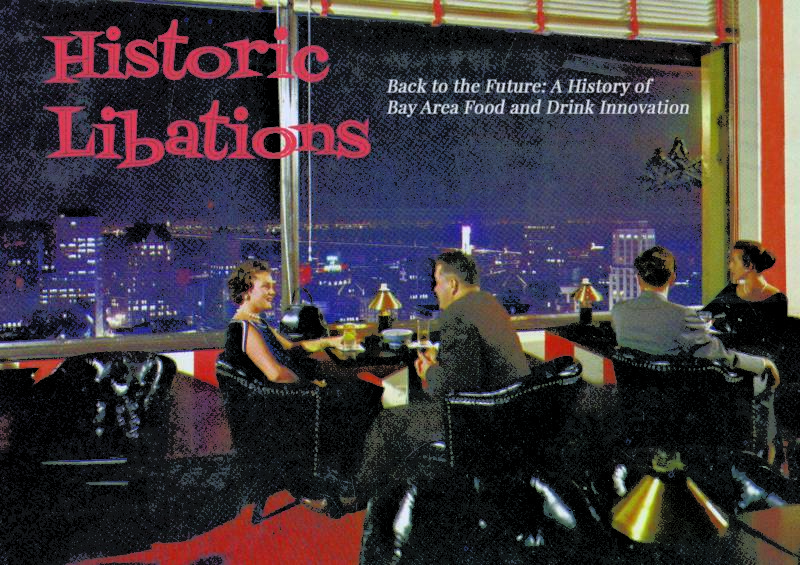 This year’s event is Back to the Future: History of Bay Area Food and Drink Innovation, held at the Old U.S. Mint. Starting at 6pm, guests can enjoy small bites, cocktails, beer, and wine, and The Buena Vista Cafe will provide iconic Irish Coffees. From 6:15pm–8pm, food and drink makers will provide 10-minute presentations and provide guests with tastings during the Tasty Talks portion of the evening, like Amy Guittard from Guittard Chocolate, along with music from Banda Sin Nombre. Kicking off at the end of November is Made In: Denmark, a four-day, pop-up experience featuring design, food, and culture from Denmark's leading creatives. The pop-up will be held at Baana, the stylish event space from Maggie Spicer (Douglas Market, WHISK) and Sarah Kotcher of Heath Ceramics. 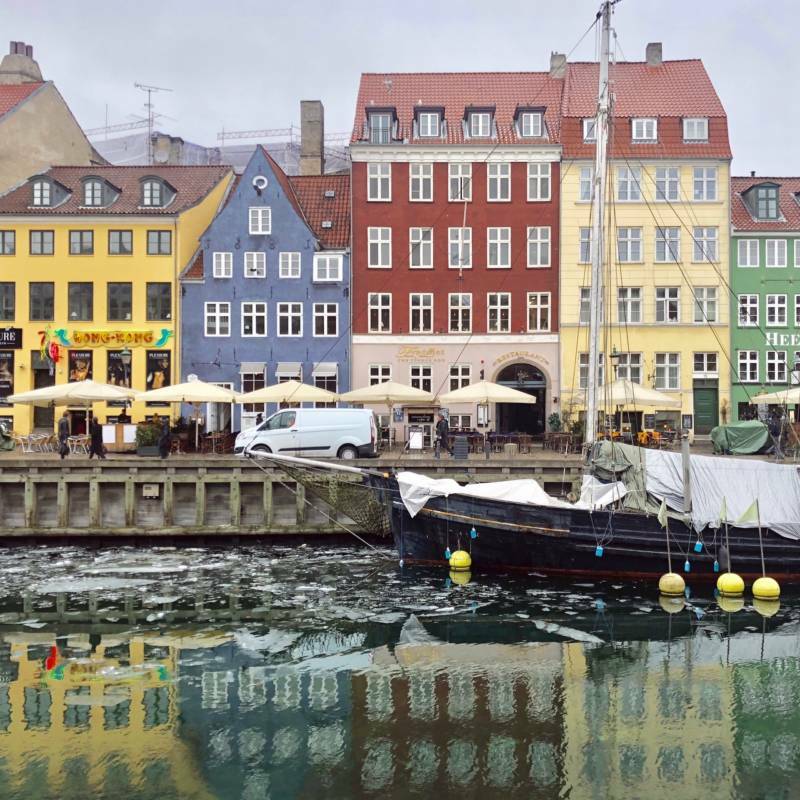 On November 29, there will be an opening panel and discussion on maker culture at 6:30pm, with Kantine smørrebrød, rose hip kombucha, and beer from Mikkeller; the Danish shop opens at 11am on November 30, with a natural wine seminar curated by Solfinn of Rødder og Vin that evening at 6:30pm; December 1 is another shop day (11am–7pm), plus a ceramic candle–making workshop with havtorn-turmeric tonic at 10:30am, a fermentation workshop with Empirical Spirits at 5:30pm, and a small group dinner with Nick Balla of Duna and Smokebread at 7pm (more on that below); and December 2 is the final day of the pop-up, with Almost-Fika: a cupping of Coffee Collective coffee (prepared by Douglas) with Fellow Products and Kantine cinnamon kanelbullar, 11am–3pm (or until sold out — note this is not a ticketed event). And you can enjoy the last day of the shop from 11am–4pm. So, about that dinner on December 1: chef Nick Balla (formerly Bar Tartine, Duna, Smokebread) is going to serve a four-course, family-style preservation dinner based on peasant traditions, with dishes like cultured squash dip, beef tartare with bottarga, pumpkin seed tahini and collard greens, slow-roasted root vegetables, parsnip-sauerkraut stew with pork and mushrooms, and stuffed persimmons with yogurt and almonds. The fabulous meal will be served with cocktails from Empirical Spirits, natural wine, havtorn (sea buckthorn) turmeric tonic, and Nick's very own vermouth made of rosé wine, black lime, anise, and fennel flowers. There's just room for 20 guests at 7pm, $165 per ticket.